How Much Caffeine Is in Starbucks Coffee Drinks? 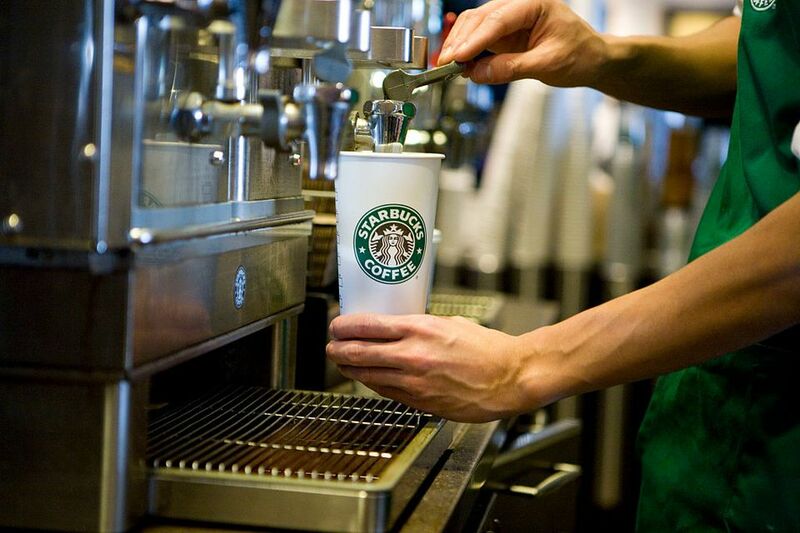 Most Starbucks drinks contain caffeine. Find levels of caffeine for Starbucks coffee drinks with this list of caffeine contents for Starbucks' Frappuccinos, espresso drinks, and coffee drinks. It's important to remember that Starbucks has its own system of drink sizes that are totally different from other coffee houses and drink vendors. Their sizes are Short (8 oz. ), Mini (10 oz. ), Tall (12 oz. ), Grande (16 oz. ), Venti (20 oz. ), Venti Iced (24 oz.) Trenta Iced (31 oz. ), though not all of the sizes are available for all of the drinks they sell. Below, you'll find listings for caffeine levels in Starbucks coffee, espresso drinks, and Frappuccinos. Caffeine levels of Starbucks tea and hot chocolate are listed separately. All caffeine measurements were collected from the Starbucks website, except where noted. The Starbucks coffee drink with the least caffeine is the Decaf Pike's Place Roast. Next up is the Starbucks Iced Coffee with milk. Another milky coffee drink, the Caffe Misto, contains slightly more caffeine. Although the Iced Coffee with Milk is fairly low in caffeine, the Iced Coffee is substantially higher in caffeine. Note: These are the numbers that Starbucks put on their website. They may vary quite a bit in real life! One lab test compared the caffeine levels in Starbucks' Breakfast Blend Coffee from one Starbucks outlet, six days in a row. The caffeine levels per 16-ounce ("Grande") cup ranged from 299.5 mg (add a nibble of chocolate and you've reached the recommended daily limit) to a whopping 564.4 mg (practically double the recommended daily limit for caffeine intake). This has to do with variations in the beans, sure, but it probably has more to do with variations in the brewing. Yikes! The iced versions of these drinks (such as the Iced Caramel Macchiato, Iced Tiramisu Latte, and the Iced Caffe Mocha) contain 75 mg caffeine in a Tall and 150 mg caffeine in a Grande or a Venti Iced. Similarly, a "solo" (single-shot) Espresso, Espresso con Panna and Espresso Macchiato all contain 75 mg caffeine, while "doppios" of the same drinks contain 150 mg of caffeine. This is due to the added caffeine from chocolate. Although the Starbucks website doesn't chart all the caffeine levels for its Caffe Vanilla Frappuccino Light Blended Beverage, it does say that its Grande Caffe Vanilla Frappuccino contains 85 mg of caffeine, so it seems reasonable to estimate that its caffeine levels for other drink sizes would be similar to those listed above. Starbucks' website doesn't list complete nutritional information for its Coffee Frappuccino Light Blended Beverage, but it does say that a Grande Coffee Frappuccino contains 90 mg of caffeine, placing it roughly on par with the drinks above. Similarly, the White Chocolate Mocha Frappuccino has a higher caffeine level (although this is due to its mocha, not due to the white chocolate; white chocolate is caffeine-free). The Frappuccino with the most caffeine is the Espresso Frappuccino.